the bustling mind of a teenage boy. So, as you can see, my blog has a slider now. Yay! Do you like it? One of the challenges that come with having a slider is to make sure that all my images from now on are of HQ quality since my slider enlarges them. Another thing that I've added to my blog as well is that little thing on my Menu bar up there! Can you notice it? I've added a new "Editorials" button! Yep, I'm going to start posting my own editorial posts from now on. I have been following a lot of fellow anime bloggers in the blogosphere and I can see that opinionated posts are really useful to write as well since these posts contribute to the otaku community and can get a discussion started. I'm not really good with writing editorials so I may have trouble trying to write a really good one yet but please bear with me because I assure you that, just like most of the time, I can grow and become better at it as I go on. Another reason why I want to write editorials is because it's also beneficial to my blog as well - in a way that I can also get a variety of posts up in my blog so that it's not just the usual stuff you see every time you visit my site. Anyways, that's all for now! Thanks for reading! See you guys next time! 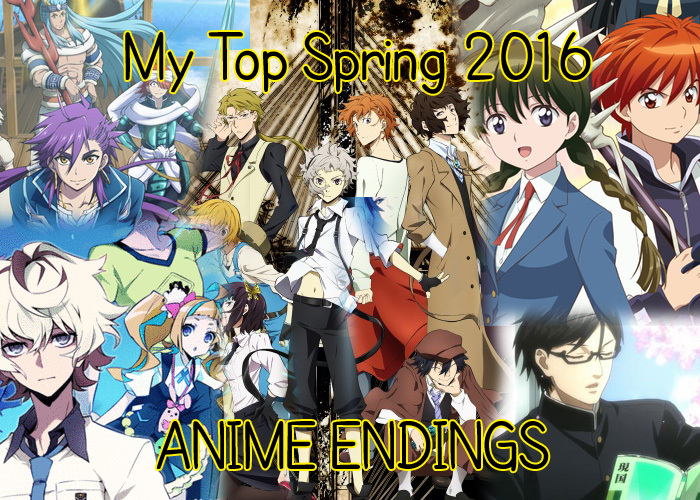 My Top 20 Spring 2016 Anime Endings! Greetings, I am Jefferson and welcome to my anime blog. This anime blog is where I'll be housing all of my reviews and recommendations for anime shows.